When it comes to productivity, putting on a good song in the background has always been a favored solution. Although many people ask me how I get any work done while listening to music, I'm much more productive when I'm listening to Michael Buble than listening to the sound of someone's keyboard four cubicles away. Up until recently, I was using an old pair of clunky computer speakers I found in my garage that I hadn't used in over seven years. With money tight, I knew that I couldn't justify to myself spending money on a pair of computer speakers when I had a "perfectly good set" to use. I thought they worked fine -- not really. But they got the job done, and that's what mattered. My office wasn't as desolate as before the speakers, where the silence was so loud that it was difficult to get any work done at all. As much as I appreciated having sound in my office, I started noticing minor details from my speakers that made me appreciate them less and less. I hated that they took up such an obnoxious amount of space on my desk. And I began noticing how awful the sound quality was. Worst of all, the speakers would randomly completely turn off by themselves, and I was forced to wiggle wires behind until I heard sound again. Over time, my frustration with the old speakers continuously increased, as did my urge to toss them out the window. One day my speakers decided to increase in volume, on their own. The more I tried turning down the sound, the higher the music blared, distracting the whole office. I finally waved my white flag and muted my computer completely while unplugging the old speakers and tossing them in to the electronics recycling bin. I was on a mission for new computer speakers. But if I was going to spend the money, I was going to buy a pair that would at least meet my needs without breaking the bank. I wanted speakers that had good sound and on-board volume controls, had a unique look or style, and didn't take up too much space on my desk. I remembered that we had recently received an order of the GOgroove SideStream clip-on speakers, so I decided to try them out for myself. These computer speakers are exactly what I was looking for! They connect to my computer through a USB cable and clip on to my computer screen, leaving plenty of space on my desk for all of the other clutter! 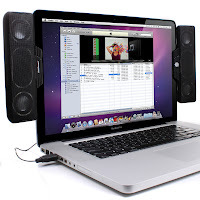 The SideStream speakers can be divided and clipped on to each side of your screen, or connect to form one full speaker! Best of all, these speakers sound amazing. I didn't realize the sound quality I was missing out on until I tried these out! The built-in amp and subwoofers generate great sound that makes listening to audio a much more enjoyable experience. The on-board volume and power controls are also very helpful when I need to quickly turn down the volume when my boss walks into the office, or to turn up on Friday afternoons for an office dance party.